The DPO (gray) mounted face-down before placement in the vacuum chamber. Both symmetrical paddles and the center spine oscillate in response to electrical excitation. An increase (decrease) in resonant frequency indicates a loss (gain) of mass. 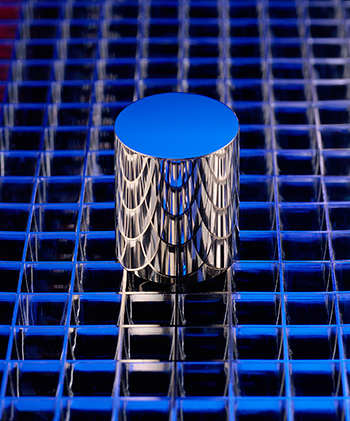 It might seem that when the world agrees on a new definition of the kilogram based on a fixed value of a physical constant, as is expected soon, no one will need to worry further about the vexing issue of mass variations over time in artifacts such as the platinum-iridium International Prototype Kilogram. But in fact the problem will persist. Even after redefinition, as a practical matter, mass will continue to be disseminated in the form of artifacts which will be susceptible to environmental effects such as adsorption or desorption of gases. To address that concern, "many experts are interested in finding an 'infallible' artifact with a material composition or coating that would make it virtually impervious to variations," says Joshua Pomeroy of PML's Quantum Measurement Division. Such a perpetually stable object may not be possible. "But in any event, we need to understand the dynamic behavior of surface mass excursions and develop models which capture that behavior – which we can then provide to customers to perform corrections." That is why Pomeroy and colleagues in the Mass and Force Group have devised and are now testing an experimental apparatus to study how various material surfaces gain or lose mass in different environments, with a sensitivity of 0.02 nanograms per square centimeter. That's the equivalent of the mass of a penny over an area of 11 km2, and about twice the sensitivity of the best available commercial device, called a quartz crystal microbalance (QCM). Like the QCM, the new tool makes use of the principle that, when all other variables are held constant, the resonant frequency of an oscillator is inversely proportional to its mass. So changes in frequency represent changes in mass. In this case, the oscillator is fabricated from a thin silicon crystal, cut so that it forms two paddle-shaped sections connected by a central axis. This double-paddle oscillator (DPO) has several simple and complex vibrational modes, and the device's detector measures one mode with a very high quality factor – that is, it continues to oscillate in the same way long after the initial excitation stops – and a sharply defined resonance frequency. The DPO, which has a surface area of 6.65 cm2 (approximately 1 square inch, and about 13 times larger than the surface of a QCM), is mounted in a vacuum chamber with radiation shielding. "Our instrument will have the DPO oriented in a face-down position," Pomeroy says. "Facing upward beneath it will be a four-pocket vapor deposition source, giving us the ability to place as many as four different substances on the DPO and to do co-deposition. "The aim is to represent the surfaces of different kinds of possible mass-artifact materials at various temperatures and in diverse gas environments. We want to accumulate quantitative, repeatable measurements that can describe what happens to artifacts when, for example, they are in transit between Beijing and Mexico City." The temperature in the chamber can be adjusted from 500 K to a few K. Deposition experiments have begun with nitrogen gas – a good initial test gas because it is safe, makes up 78 % of air, and at 10 K has a "sticking coefficient" close to 1. (That is, all the nitrogen molecules introduced into the chamber are adsorbed on the DPO surface.) It will be months before the performance of the device is fully characterized. But when it is, comparison studies of various candidate materials and coatings for a new class of mass standards can begin. "Many people are hoping for a 'silver bullet' solution," Pomeroy says. "But that may not be possible. The mass variation problem has a number of different components to it, some of which – such as microscratches – we can't control. And even when we are eventually able to provide good models for mass variation resulting from basic chemical adsorption processes, we will still need to take account of other properties such as porosity effects." For example, diamond-like carbon coatings have been suggested as a solution to mass variations, and may end up as the material of choice. But those coatings can have irregular pinholes and voids that affect the porosity of the surface, and hence its adsorption characteristics. The researchers are also particularly interested in the time scale over which mass variations take place. Periodic measurements of the platinum-iridium kilogram prototypes indicate excursions on the order of a few parts in 108 over 100 years. But whether this is a gradual or abrupt process is not fully understood. The International Bureau of Weights and Measures (BIPM) specifies a protocol for cleaning a mass standard prior to recalibration. "They clean it, and the mass goes down," Pomeroy says. "Then it rises again, and then after some time interval it is calibrated." The calibrated mass value along with an additional mass established by a "growth" model developed by the BIPM, are used to predict the mass value of the standard at a future date. "But very little is understood about how mass changes on timescales shorter than that," Pomeroy says. "We know that the mass values of the prototypes drift over decades. But nobody knows when the change happens. It could be in the first five minutes after cleaning." In addition, Pomeroy is planning to incorporate a research-grade QCM into the new instrument and compare its output with the DPO values. The Mass and Force Group occasionally receives requests from QCM manufacturers and users to provide NIST traceability for their devices. At present, however, there is no system for doing so, and this effort may provide a pathway for NIST to offer QCM traceability in the future. All that, however, is a long way off. "Right now," Pomeroy says, "we're like miners who are building a flashlight to shine around a cave. We don't know what ores are present, or which are suitable for extraction, or will have a positive return on investment. But we know we need a flashlight to figure it out." (a) Test chamber with cryogenic cooler at top, vacuum pump at bottom, and residual gas analyzer at left. (b) Geometry and dimension of the double-paddle oscillator. (c) Close-up of the sample mount with a DPO assembled.